Our backyard is full of stuff we sometimes don’t realize we can put to use in planting at the garden. Part of Vermiculture and Composting blog and our family’s call is for self-sustainability, recycling and green environment. Today, I will discuss how we proved to do things easy if we just learn to recycle. 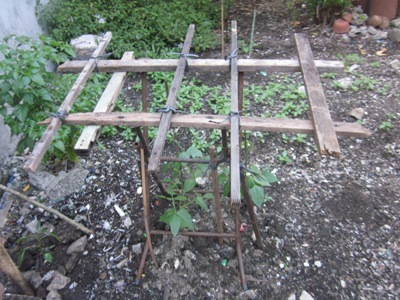 We are growing string beans (sitaw in Tagalog) and testing it out if we could come up with an indigenous trellis out of our old backyard garden scraps.